The versatility of our systems allows them to be customized for each application. We offer a range of dataloggers, from the most basic system with just a few channels to expandable systems that measure hundreds of channels. Scan rates can be programmed from once every few hours to 100,000 times per second, depending on the datalogger model. Measurement types, processing algorithms, and recording intervals are also programmable. 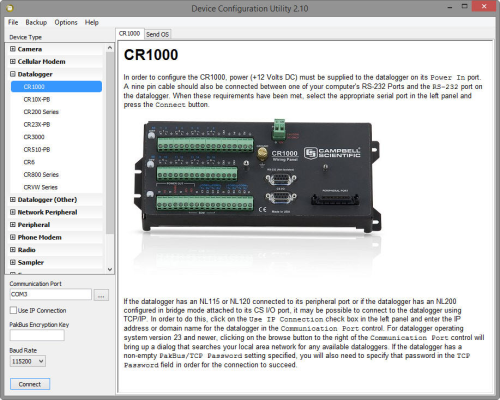 Our systems have powerful onboard instruction sets: simply choose sensor type, scan rate, and measurement channel. On-board mathematical and statistical processing allows data reduction in the field and allows measurements to be viewed in the desired units, whether that be microstrain, centimeters per second, revolutions per minute, meters, Amperes, or inches. 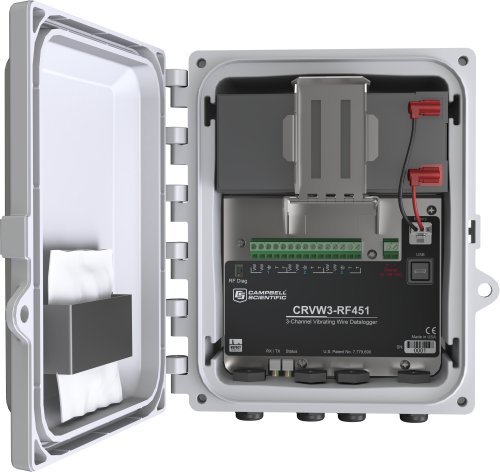 Our system's versatility extends to control as well—our systems can monitor and control external devices based on time or measured conditions, allowing savings in time and equipment, and possibly preventing, or warning of, dangerous conditions. They are rugged enough to be in use in geotechnical studies and mines world wide. Our systems can stand alone. Once programmed and powered, no human or computer interaction is required, although data are typically downloaded to a PC for further analysis. A telecommunications or hardwire link allows data to be monitored and graphed in your office rather than in the field. Data from a number of stations and from a number of applications can be monitored from a single laptop or desktop computer. The low power drain typically allows our data acquisition systems to be powered by solar panels and batteries. If 110/220-Vac power, vehicle power, or external 12-Vdc batteries are available, you can use those as well. Nonvolatile data storage and battery-backed clock ensure data capture and integrity. Because our dataloggers have many channel types and programmable inputs, all of these sensor types can be measured by one datalogger. Channel types include analog (single-ended and differential), pulse counters, switched excitation, continuous analog output, digital I/O, and anti-aliasing filter. Using switched or continuous excitation channels, our dataloggers provide excitation for ratiometric bridge measurements. The availability of multiple communications options for retrieving, storing, and displaying data also allows systems to be customized to meet exact needs. Onsite communication options include direct connection to a PC or laptop, PC cards, storage modules, and datalogger keyboard/display. Telecommunication options include short-haul, telephone (including voice-synthesized and cellular), radio frequency, multidrop, and satellite. 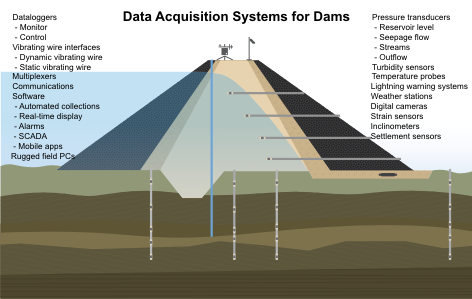 The following is a list of companies that have developed expertise in our products and provide consulting, installation, and other services for dam monitoring—structural applications.